* These two authors contribute to this paper equally. Gene transfer methods are promising in the field of gene therapy. Current methods for gene transfer include three major groups: viral, physical and chemical methods. This review mainly summarizes development of several types of chemical methods for gene transfer in vitro and in vivo by means of nano-carriers like; calcium phosphates, lipids, and cationic polymers including chitosan, polyethylenimine, polyamidoamine dendrimers, and poly(lactide-co-glycolide). This review also briefly introduces applications of these chemical methods for gene delivery. Keywords: Non-viral, Gene delivery, Vectors, Chemical Methods. A variety of genetic mutations, which alter cellular proliferation, angiogenesis, metastasis, and tumor immunogenicity result in human cancer, which has become one of the biggest threats to human life . Despite increasing understanding of the molecular mechanism of cancers [2, 3], many malignancies remain resistant to established traditional treatments [4, 5]. However, the definition of tumor-associated genetic mutations has heightened interest in cancer treatment as the target for gene therapy [6, 7]. The therapeutic expectations of gene therapy are considerable because of its significant potential for the treatment of inherited and acquired life threatening diseases caused by genetic deficiencies and abnormalities, such as cancer, acquired immune deficiency syndrome (AIDS), cardiovascular diseases, and certain autoimmune disorders. Gene transfer, or transfection, is a fundamental technique in molecular biology used to manipulate cells or study gene function and protein expression in vitro. When gene transfer is used in disease treatments, it is aimed at curbing genetic diseases by introducing genes coding for functional proteins to cells so as to normalize the cells and even organs. Gene transfer is not only used to treat genetic diseases, but also to produce large quantities of secreted proteins for direct therapeutic application or vaccines production. As is well known, it is difficult for nucleic acids to diffuse directly through plasma membrane due to their size and/or their physicochemical properties, for instance, hydrophilicity. Various strategies for the transfer of nucleic acids, especially genes, have thus been developed [8-10]. The ideal gene delivery and transfection systems should have high transfection efficiency, low toxicity to the cells and single cell specificity, while also is able to simultaneously treat heterogeneous systems with many different cells. Current gene transfection systems contain three major groups: viral (transduction), physical (direct micro injection) and chemical methods. Initially, the gene transfer technique was envisioned to transform cells utilizing various viral vectors, as listed in Table 1, by inserting a functional gene into a nonspecific site within the genome. They are therefore the most advanced in development due to their efficiency and specificity in entering cells and expressing the genes carried in the modified viral genome using the cell's own biosynthetic machinery, particularly in vivo . Unfortunately, well-known adverse effects were observed while using this system, such as immunogenicity, difficulties in handling and large-scale production, and limited length of the genes. Potential and real risks were observed in a clinical trial of an HIV vaccine developed from three weakened adenoviruses by Merck . The failure to protect participants from HIV was suspected to associate with the vector itself or/and the pre-existing adenoviruse immunity of the participants, which have been the obstacle on the road from lab research to clinical use . Physical methods for gene transfer (Figure 1) include biolistics, jet injection, ultrasound and so forth [25-29]. These methods have been developed quickly because such methods can directly penetrate genes into cells by stimulations of electric impulses, fine needle puncture or high-pressure gas, which may bypass some of the side effects linked to viral or biochemical approaches, such as limitation of the gene length that can be carried by the physical vectors. Physical methods mediate the direct penetration into the cytosol of both small and large nucleic acid molecules, as well as any other non-permeable molecule. Moreover, these physical systems are effective for single or multiple target cells at an intended location and carry little risk of dispersion of transfection reagents. However, they also present several drawbacks. On one hand, it is difficult for the genes to be transported to the nucleus because of little access in passing through the membrane or enzymatic digestion of the naked DNA or RNA, which results in the low transfection efficiency and limits its clinical application. On the other hand, they present damage to cells, difficulty in large-scale manipulation, labor-intensive protocols and/or the necessity of costly instruments . 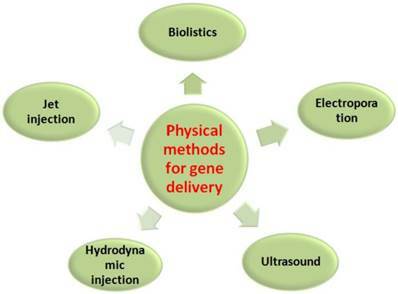 Primary physical methods for gene delivery. Viral systems for gene delivery. Detailed information and cell types (in nine cell lines) with relatively higher luciferase gene transfection efficiency without fetal calf serum of six commercially available transfection reagents. Although both viral systems and physical methods have drawn much attention of the researchers, they suffer from a number of drawbacks as described above. To overcome these drawbacks, a variety of chemical transfection systems, such as calcium phosphates, lipids, and cationic polymers including polyamidoamine dendrimers and polyethylenimine (PEI), etc, have been developed since late 1960s [31-32]. Chemical gene delivery systems were recognized as an alternative to viral gene vectors for their potential in avoiding some problems associated with the viral systems . Great efforts have been made to increase the gene transfer efficiency and to minimize toxicity of these chemical transfection reagents by tuning their molecular structures and other features including size, surface potential and/or by combining them with other bio-functional molecules . Currently, a variety of synthetic transfection reagents have been commercialized for in vitro gene transfer and both their detailed information and the comparison results of transfection efficiency are listed in Table 2 . One of the most important reasons why these materials such as lipids and polymers can be used as the vectors for gene delivery is that they can interact with plasmid DNA (pDNA) to form nano-sized complexes, which is the premise to pass through the cell membrane. With the development of nanomaterials, nano-sized lipids and polymers have shown great potential as non-viral vectors for gene delivery. Currently, both gene therapy and nanotechnology are controversial topics which have and will get much skepticism from both the general public and researchers for their significant safety problems. Nevertheless, considerable achievements in clinical use have already been made in both gene therapy and technology through the efforts of researchers [35, 36]. Moreover, the fastly developing nanotechnology and theranostics provide the powerful support for the development of the nanocarrier-based gene transfer methods . Though there will be a lot of difficulties to resolve, they will be widely used with numerous research and rigorous administration, just like the genetically modified foods, which have be eventually admitted by FDA (U.S. Food and Drug Administration) and widely used in the world. Herein, we mainly summarize several types of chemical transfection methods based on nanocarriers, which include calcium phosphates, lipids, and cationic polymers like chitosan, PEI, polyamidoamine dendrimers, poly (lactide-co-glycolide) and so on. On one hand, we discuss the mechanisms underlying these approaches as well as their achievements and, on the other hand, we compare their relative advantages and potential therapeutic applications in research, preclinical and clinical medicine. The systematic research on calcium phosphate gene transfer system was originally developed by Graham and Vander Eb . 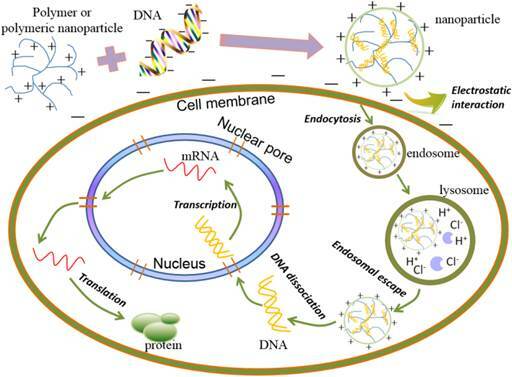 In 1990, Orrantia explored the intracellular distribution of DNA internalized through calcium phosphate precipitation and proposed a new pathway in which exogenous DNA molecules may be transferred directly by intermediary vesicles from the endocytic-lysosomal compartment to the nucleus . Since then, the calcium phosphate system has been widely used as an easy-to-use, cost-effective and highly safe gene transfer technique [40-41]. The conventional calcium phosphate gene transfer system is produced by particulate calcium phosphate co-precipitated with DNA. DNA-calcium phosphate co-precipitates arise spontaneously in supersaturated solutions. However, highly effective precipitates for transfection purposes can be generated only under very strict physic-co-chemical conditions because concentrations of calcium, phosphate and DNA as well as temperature and reaction time affect the formation of DNA-hydroxyapatite particles in a profound way. Most importantly, transfection efficiency and expression levels in both transient and stable transfections are influenced by those conditions referred above [42-43]. Other critical disadvantages of the calcium phosphate gene transfer system are insufficient efficiency and poor reproducibility compared with other non-viral carriers [44-45]. To get rid of these disadvantages, a lot of new methods based on the calcium-phosphate-DNA precipitation have been reported. First of all, nano-sized materials have drawn increased attention because of their intrinsic features based on the nanoscale size. Cao et al. developed calcium phosphate nanocomposite particles encapsulating plasmid DNA (CaP-pDNA), whose transfection efficiency was significantly higher than that of standard calcium phosphate transfection . Elangovan et al. prepared nano-sized calcium phosphate particles, which displayed higher levels of biocompatibility and transfection efficiency in vitro . Furthermore, there have been some optimizations of the fabrication process. Alireza et al. developed a new approach to prepare calcium phosphate nanoparticles through simulated body fluid (CaP-SBF), which indicated considerably high transfection efficiency in vitro for CaP-SBF/DNA complexes than those made in water . In conclusion, the calcium phosphate co-precipitation method is an attractive option for their biocompatibility, biodegradability, ease of handling and capacity to adsorb pDNA. Nevertheless, there exists large space to make efforts to improve the transfection efficiency by developing new synthesis approach or combining calcium phosphate nanoparticles with other materials or methods . Among the non-viral vectors, liposomes based on cationic lipids are by far the most common gene delivery systems and have been the subject of considerable interests as non-viral delivery vectors [49-50]. 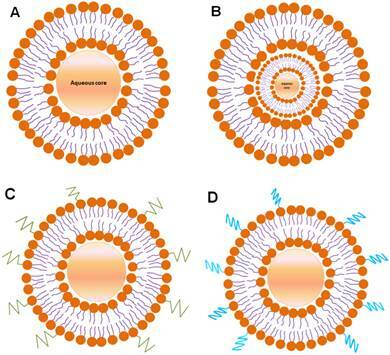 Liposomes are synthetic lipid spheres composed by fatty acid on polymers with one or more bilayered membrane structure surrounding an aqueous core that can be used to encapsulate small molecules (Figure 2A, 2B). The direct complex formation of cationic lipids with pDNA results in the self-assembly of liposomes [51-52]. Several parameters, which influence the lipoplex formation efficacy, such as preparation procedure, mixing ratio, pDNA concentration, size of the applied cationic liposomes and ionic strength of the buffer were investigated . As known, liposomes have the distinct advantages of being both nontoxic and biodegradable because they are composed of naturally occurring substances. Liposomes have been shown to provide stable encapsulation for various molecules like gene, which can protect DNA against enzymatic degradation as well as facilitate cellular uptake and endosomal escape, leading to effective gene transfer. They have possessed not only the excellent biocompatibility and low immunogenicity, but also the ability to deliver large pieces of DNA with well defined physicochemical composition and ease of handling and preparation. Furthermore, they have potential to transfect all kinds of tissue and cell types [54-57]. An upsurge of global interest in developing efficient cationic lipids for gene delivery was therefore witnessed in recent years [58-60]. However, due to their positive charge, cationic liposomes may undergo non-specific interaction with negatively charged cellular components (such as serum protein and enzymes), which may result in reduction of cellular adhesion, hemolysis, and low transfection efficiency [61-62]. In addition, organic reagents such as ethylether and chloroform are involved in the preparation of liposomes, which may be harmful to both the cells and tissues. In general, cationic liposomes are not good enough for effective gene therapy because of their potential cytotoxicity and low transfection efficiency [63-66]. Therefore, it is significantly important to develop novel nontoxic cationic systems with both effective gene transfection ability and good safety. The cytotoxicity of cationic liposomes mainly results from their cationic nature and the linker group . There are correspondingly two major kinds of methods in the component optimization to improve transfection efficiency and reduce cytotoxicity. Firstly, great attention has been paid to synthetic modifications with the positively charged headgroup. For example, heterocyclic ring such as imidazolium pyridinium and protonated polyamine groups were introduced into cationic liposomes to decrease the positive charge of the cationic head [68-73]. Secondly, modification with the linker functionalization group is a good option to improve the properties of liposomes for gene delivery. Cationic liposomes with ether linkers are too stable to be biodegraded, leading to higher toxicity despite their good transfection efficiency . However, the ester or amide linkers are more biodegradable and always bring on less cytotoxicity in cultured cells. Moreover, the lipids with these two linkers are easier to degrade in the circulatory system . Carbamate is a widely studied structure with ability to keep lipids stable in the circulatory system while it may decompose and release DNA after entering endosomes . Thus, lipids with a carbamate linker may be rapidly degraded into small molecules with much lower toxicity and, therefore, several cationic lipids were designed with the participation of carbamates [77-78]. Besides, cationic liposomes conjugated with polyethylene glycol (PEG) and/or other molecules such as ligands and peptides (Figure 2C, 2D) has been a great improvement leading to small particle sizes, controlled structures, regular morphology, and good stability . To evaluate the potential of the lipid transfection reagents in the clinical application, many researchers have embarked on the transfection experiments in vivo with functional gene [80-81]. Nabel et al. have developed a protocol which relies upon the direct transmission of human HLA-B7 gene into established tumors in vivo, which can perform successful gene expression and show no apparent toxicity . Above all, cationic nano-sized liposomes have been investigated widely for a long time both in vitro and in vivo. Their gene delivery efficiency can be improved by intergrating with varying auxiliary methods, such as the availability of light sources and highly sensitive detection technologies . But the progress is not great enough and the transfection efficiency and cellular non-toxicity have not been qualified to effective gene delivery. In other words, it is a way full of difficulties and challenges for cationic liposomes to move from researches to clinical applications in order to contribute to gene therapy. Cationic polymers have shown promise as a safe, predictable, biodegradable and nontoxic alternative to viral gene therapy, relying on endocytosis of synthetic polymer-based carriers bio-conjugated to the targeted gene or other biological molecules [83-84]. 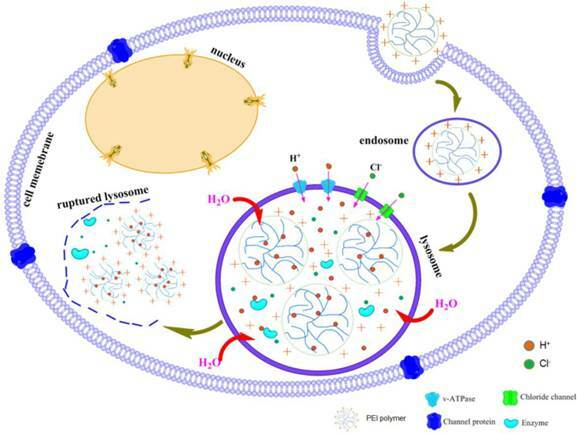 Cationic polymer-based gene carriers (polyplexes) showed good biodegradability, low toxicity, triggered nucleic acid release, structural diversity and relatively higher transfection efficiency than liposomes [85-87], and the gene delivery process of polymers is described in Figure 3. Many kinds of polymers have therefore been investigated for gene delivery, such as chitosan, PEI, polylysine, polyamino ester and so on [88-92]. Cationic segments, organelle-escape units, and degradable fragments are essential to a polymer-based vehicle for gene delivery. The majority of these cationic segments are derived from polyamines, including polylysine, polyarginine, chitosan, polyethylenimine and polyamidoamine dendrimers. Not only do these cationic polyamines protect DNA from degradation, they can also promote the endocytosis of the carriers by endosomal membranes. Degradable fragments are necessary for the carriers to release the DNA once the complexes enter the cytoplasm. Furthermore, the organelle-escape units are one of the key elements influencing the transfection efficiency. Schematic representation of the structure of liposomes. The schematic presentation of gene delivery process of polymers. However, there still exist numerous in vitro and in vivo barriers for polymer-based vehicles to achieve ideal transfection efficiency. For in vitro transfection, polymeric nanoparticles have no structure as magic as viruses to enter cells and just depend on the unpredictable endocytosis. Thus on one hand more detailed information about the endocytosis mechanism obtained by varying technical methods is needed to increase the entrance into the cells. On the other hand, the size, surface potential and N/P ratio (ratio of nitrogen of polymer to phosphate of DNA) were deeply investigated and some targeting groups like nuclear localization signal were integrated to the nanoparticles. Morover, the escape of nanoparticles from the organelle and DNA from the complexes is one of the key elements influencing the transfection efficiency. For example, particular interest was garnered by PEI mainly for its organelle-escape units. Another big problem for polymeric nanoparticles is the cytotoxicity, which results from poor biodegradability. So the degradable moieties have been incorporated into polymer, such as coating with human serum albumin, dextran, PEG and so forth. Out of these, the specific hurdle for transfection in vivo is that polymeric nanoparticles are foreign materials whose invasion will lead to the immune response by the body. The most effective solution is PEGylation, which help avoid the clearance of the reticuloendothelial system. Many researchers are dedicated to devising polymer-based vehicles for exogenous gene transfection in vitro and great efforts have been made for gene transfection in vivo. During the past 20 years, a good many in vitro and in vivo studies focusing on gene therapy have been reported on chitosan for its outstanding biodegradability (Figure 4) [93-95]. Chitosan is an attractive polymer for gene delivery, showing excellent biocompatibility, admirable biodegradability, ecological safety, low toxicity, antimicrobial activity and low immunogenicity [96-100]. And chitosan with abundant amine and hydroxyl groups can be easily modified to enhance efficiency for gene transfer . However, their application in gene delivery is limited for their insolubility under physiological pH condition, insufficient charge and low transfection efficiency [102-103]. The chitosan-DNA complexes are very easy to synthesize and are more effective in comparison with the commonly used polygalactosamine-DNA complexes. The stability of the complexes depends on several factors such as chitosan chain length and ratio of chitosan/DNA. The in vitro transfection efficiency was affected by factors such as the degree of deacetylation (DDA), molecular weight (MW) of chitosan, nitrogen atoms (N) in the chitosan/the phosphorus atoms (P) in DNA (N/P) ratio, physicochemical properties of polyplexes, and so forth [104-107]. Considering these important factors, great efforts have been devoted to obtain higher transfection efficiency [107-109]. Taking the MW for example, investigation on the MW of the polymer revealed that on one hand high MW chitosan offered better nucleic acid complexation and stability but showed drawbacks such as aggregation and low solubility at neutral pH [110-112]. On the other hand, low MW chitosan allows for a more efficient intracellular release but low complexation . Hence finding a balance between these opposing effects is important to obtain a chitosan carrier of optimal MW. To address the problem of insolubility under physiological pH condition, hydrophobic and hydrophilic modifications have been applied to obtain chitosan derivatives with favorable characteristics. Hydrophobic modifications, such as deoxycholic acid modification and thiolation, could reinforce cell binding, alleviate serum inhibition, protect the pDNA from enzymatic degradation, and facilitate pDNA internalization, which have been proven good for efficient gene transfer [114-117]. While a plenty of hydrophilic modifications, such as PEGylation and quaternization, were also introduced to enhance transfection efficiency due to increased water solubility at physiological pH and improved intracellular pDNA release [118-120]. The distinct benefits of hydrophobic and hydrophilic modifications have promoted the possibility of obtaining well-defined amphiphilic chitosan derivatives [121-122]. Nevertheless, certain factors acted differently when combined with various states of other factors. What is most important is therefore to find a fine balance between all the tunable influencing factors on chitosan to get ideal transfection efficiency [123-125]. Primary applications of chitosan in biomedical fields. The modes of administration also significantly influence gene delivery efficiency and new methods have been reported [126-127]. Using a novel technique, Dai et al. studied the gene delivery by chitosan-DNA nanoparticles through retrograde intrabiliary infusion (RII), which proved a possible routine to achieve low-toxic, liver-targeted gene delivery . Currently, the optimization of chitosan-based vectors for gene delivery includes two dominant points, the modification of chitosan itself and combination with other vectors . Consequently, the former should be incorporated with the latter, which may be the development tendency of chitosan-based vectors . Liu et al. synthesized amphiphilic chitosan-N-octyl-N-quatenary chitosan (OTMCS)-PEI which revealed lower cytotoxicity and the OTMCS-PEI/DNA complexes showed higher transfection efficiency in vitro and in vivo in comparison with PEI 25 kDa, the commercially available one . Among various kinds of cationic polymers, PEI has been the most widely investigated because of not only its strong DNA condensation capacity and intrinsic endosomal activity, but also its unique buffering capacity called proton sponge effect (Figure 5). It facilitates the release of the gene into the cytoplasm through osmotic swelling and burst of endosomes [131-132]. Figure 6 shows two forms of PEI, linear PEI (lPEI) and branched PEI (bPEI). PEI nanoparticles have been prepared by two strategies that either by complexation of PEI with DNA to form nano-complexes  or use of cross-linkers to first form PEI nanoparticles followed by DNA loading onto it [134-135]. The transfection efficiency of PEI/pDNA polyplexes is associated with the N/P ratio [135-136]. PEI polyplexes of N/P ratios higher than 3 contain an excess of free PEI which is supposed to contribute to the endosomal escape , which explains the usually enhanced transfection efficiency at higher N/P ratios. The transfection efficiency of PEI/pDNA complexes depends largely on the molecular weight (MW) of PEI. Commercially available PEI 25 kDa has excellent transfection efficiency in comparison with low-molecular-weight PEI (LMW PEI) [138-140]. With its high cationic charge density, it can effectively condense DNA and form nanometer-sized particles capable of being endocytosed . However, high-molecular-weight PEI (HMW PEI) (25 kDa), with efficient gene transfection in vitro, lacks degradable linkages (C-C or C-N bonds) and is too toxic for therapeutic applications, which contributes to an acute cytotoxicity due to cell membrane disruption followed by induction of apoptosis [142-143]. On the contrary, LMW PEIs possess low cytotoxicity as well as undesirable transfection efficiency [139, 144-146]. It is therefore a significant challenge to prepare PEI-based vectors with high transfection efficiency as well as low cytotoxicity [147-149]. Moreover, when it comes to in vivo transfection, PEI has the tendency to aggregate red blood cells, bind complement components, and is not easy to be broken down and excreted [150-151]. Schematic representation of proton sponge effect of PEI polymer. Two forms of PEI. (A) linear PEI, (B) branched PEI. There are two primary ways to overcome these problems, modification of HMW PEIs to decrease the cytotoxicity and modification of LMW PEIs to improve the transfection efficiency. As for HMW PEIs, degradable linkers are used to conjugate PEI to yield polymers with sufficient amounts of amino groups. Lee et al. first introduced disulfide cross-linked PEI using dithiobis succinimidyl propionate and dimethyl-3,3'-0-dithiobispropionimidate as cross-linking agents, which showed apparently reduced cytotoxicity . Breunig et al. have reported that several cell lines transfected with disulfide crosslinked lPEI has shown transfection efficiencies of over 60% under conditions that maintain a cell viability >90% [153-154]. Studies of PEI crosslinked with other hydrolytically degradable groups have also been reported with efficiencies near or exceeding that of commercially available standards, as well as reduced cytotoxicity [155-162]. To improve the transfection efficiency of LMW PEIs, one of the main approaches is to incorporate hydrophobic moieties into LMW PEIs. In previous studies, some hydrophobic segments have been introduced into LMW PEIs, such as polycaprolactone, cholesterol, lipid and other hydrophobic substituents [163-169]. Those results indicated that transfection efficiency could be apparently improved after introducing hydrophobic chains into LMW PEIs, which might result from the unique properties of amphiphilic cationic polymers. The self-assembly of amphiphilic polymers could improve the local cationic density and then facilitate nucleic acid condensation. In addition, hydrophobic substituents were expected to enhance interactions with lipophilic cell membranes and facilitate the uptake of the complexes. After release of the nucleic acids, self-assemblies of amphiphilic polymers might be disassembled into unimers, leading to relatively low cytotoxicity . In addition, disulfide cross-linked PEI-SSX and ester-cross-linked PEI derivatives based on different cross-linking agents and LMW PEI have also been investigated and exhibited higher gene transfection efficiency and lower cytotoxicity than PEI (25 kDa) in different types of cell lines [171-173]. Besides, the adjustment of particle size can also lead to effective gene transfer. Recently, it has been reported that copolymers obtained by the reaction between PCL diacrylate and LMW PEI show effective and stable DNA condensation with particle sizes less than 200 nm . No matter HMW PEIs or LMW PEIs, intracellular release of DNA from the complexes is of the utmost importance for the transfection efficiency. In order to trigger intracellular release of therapeutic genes from cross-linked PEI, there are two promising methods, hydrolytic degradation and disulfide reduction. Disulfide cross-linked polymers were synthesized to stimulate the DNA release in the cytoplasm by intracellular reducing environment . In conclusion, although PEI has been investigated widely in animals and humans for gene delivery in vitro and in vivo , there exist a lot of challenges such as the cytotoxicity, insufficient transfection efficiency and instability of the complexes in complicated physiological environments, which blocks their clinical applications. Many kinds of PEI derivatives have shown relatively lower cytotoxicity and higher transfection efficiency, nevertheless, it is really a long way to go before using them for clinical treatment. Generally, new vectors with well-marked reduced toxicity, improved transfection efficiency and better stability of the complexes in vivo, are of great importance. That is to say, great emphasis should be placed on the inner mechanism of toxicity, effective targeting of cells or organs, enhanced nuclear localization and how to pass through the barriers to cells or nuclei. Polyamidoamine (PAMAM) dendrimers are highly branched spherical polymers that are highly soluble in aqueous solution and have a unique surface of primary amino groups [177-179]. Moreover, PAMAM dendrimers are a class of macromolecules that are uniformly dispersed in comparison with many other kinds of polymers investigated recently [180-183]. They can be produced in large quantities and precisely synthesized over a range of molecular weights. The structure starts from a core molecule and grows through stepwise polymerization process. With each new layer or generation, the number of surface amine groups exactly increases, which have been used for the attachment of antibodies, contrast agents, and radio pharmaceuticals for applications in a number of different areas of biology and medicine [181, 182]. PAMAM dendrimers have therefore been extensively explored as non-viral gene carriers because of their unique characteristics, such as narrow molecular distribution, defined size and shape, high molecular uniformity and highly functionalized terminal surface [184-187]. They are nano-spherical, hyper-branched and mono-dispersive molecules which are suitable for gene delivery. Dendrimers have an increased ionic interaction with DNA and produce very stable and highly soluble DNA complexes . However, there exist several problems to be solved. First, although PAMAM dendrimer-based gene transfection reagents such as Superfect and Priofect have already been commercially available, these products are more expensive than other cationic polymers and are based on high generation dendrimers, the synthesis of which is labor-consuming . Second, the transfection efficiency of PAMAM dendrimers is generation-dependent. Low-generation PAMAM, such as G0-G3 show poor gene transfection efficiency and lower cytotoxicity, but high-generation PAMAM, such as G4-G8 exhibit slightly better gene transfection efficiency and higher cytotoxicity [190-192]. But ideal gene transfection reagents should have both high transfection efficiency and low cytotoxicity and thus plenty of efforts have been made to achieve it [193, 194]. On one hand, high generation PAMAM dendrimers were functionalized with different moieties as showed in Table 3. However, high transfection efficiency is usually accompanied with high cytotoxicity in these gene delivery systems. So the paradox between transfection efficiency and cytotoxicity makes it of crucial importance to break up the correlation between them for PAMAM dendrimer-based gene carriers in a near future . A promising solution to this issue is to prepare highly efficient gene transfection reagents using low generation dendrimers. Liu et al. synthesized disulfide cross-linked low generation PAMAM dendrimers for gene delivery which showed higher transfection efficiency than G2 and G5 PAMAM dendrimers and comparable efficiency with bPEI 25 kDa . Uekama et al. developed cyclodextrin-modified low generation PAMAM dendrimers for DNA delivery [201-203, 211]. In their studies, relatively high gene transfection efficiency and low cytotoxicity of the cyclodextrin-dendrimer conjugates were achieved. On the other hand, hyper-branched PAMAM dendrimers and their modifications have been extensively investigated to increase pDNA binding [212-215]. An interesting option to obtain efficient gene delivery carriers is to increase dendrimer flexibility using a triethanolamine core. In this case the enhanced distance of the first generation branching points to the central amine leads to a more flexible dendrimer and thus increases pDNA binding . Zeynep et al. prepared Jeffamine-cored PAMAM dendrimers (JCPDs) for gene delivery, which showed considerably improved transfection efficiency as the number of generation increased . JCPD can therefore be considered as an efficient transfection reagent and can be effectively used for gene delivery applications, which is based on the finding that partially degraded PAMAM dendrimers show better flexibility and greater interaction with pDNA and perform successful transfer of pDNA . Finally, the transfection efficiency of specific dendrimer varies between different types of cells, which is the common problem for all kinds of gene carriers and may be closely related with different structures of different cells . Functionalization of high generation PAMAM dendrimers to achieve higher transfection efficiency. Poly (lactide-co-glycolide) (PLGA), as the name suggests, is composed of lactic and glycolic acids, which are linked together by ester linkages. The polymer degrades when the free carboxylic end groups form. The safety of PLGA-based nanoparticles in the clinic has been well established . Incorporation of pDNA into PLGA particles protects pDNA from in vivo degradation, triggers the controlled release of the pDNA, and acts as a transfection vector for mammalian cells [220-223]. A PLGA based delivery system for pDNA has been widely studied and demonstrated effectively [224-232]. However, the low release rate of pDNA from conventional PLGA, negative charges which hinder DNA encapsulation and changes of pDNA structure induced by the acidic microenvironment of the PLGA particles made it difficult to perform ideal results [233-236]. Recently, a new delivery system incorporating CaP-pDNA co-precipitate into PLGA microparticles was explored and the CaP-pDNA PLGA micron delivery system has demonstrated a better pDNA loading efficiency and better protection of pDNA relative to PLGA based micron delivery system itself . Unfortunately, there are some obvious drawbacks of this PLGA micron system, such as slow release of pDNA and consequently low transfection efficiency in vitro due to the large size of the carrier [226, 238-239]. Orrantia et al. traced 32P-marked DNA inside the cell and concluded that the particle size in nanoscale would help the protection of pDNA from degrading enzymes . Loyter et al. has also emphasized the importance of the nano-scaled particle size after studying the intracellular transport of 3H-marked DNA . And in some cell lines, only the nano-sized particles are taken up efficiently other than microparticles (e.g. Hepa1-6, HepG2, and KLN205) . Those studies revealed the importance of the particle size in gene transfection efficiency. Recently, Tang et al. reported a simple and reproducible method to prepare well-defined CaP-pDNA PLGA nanoparticles for the incorporation of pDNA, which will enhance pDNA encapsulation within the particle, provide an ideal release rate of pDNA, and increase transfection efficiency in vitro . In another study, Shau et al. concluded that a one-step preparation of nanoparticles with PLGA pre-modified with PEI is better in requirements for DNA delivery compared with those prepared in a two-step process (preformed PLGA nanoparticles and subsequently coated with PEI) . Zeng et al. indicated that nanoparticles fabricated with PLGA alone resulted in poor encapsulation of pDNA while chitosan-modified PLGA nanoparticles exhibited much higher loading efficiency than unmodified PLGA nanoparticles . Generally, PLGA-based nanoparticles have already been widely investigated in drug delivery in vivo for its safety and used for clinical usage, but its application for ideal gene delivery remains a way filled with challenges and prospects. As the polymers arouse more attention of the researchers, more and more new polymeric carriers have been developed for gene transfer. Some typical polymeric carriers are listed in Table 4 and at the same time many other polymeric carriers such as polypeptide and polyphosphoester have also been reported [246-250]. Poly-L-lysine (PLL) is a kind of natural and biocompatible polypeptide with excellent pDNA condensation capacity and one of the cationic polymers firstly used for gene delivery [251-252]. However, the high cytotoxicity and the low transfection efficiency of PLL severely limit its wide application in gene delivery [253-257]. Many attempts have been made to improve the gene delivery efficiency. For example, PEG was introduced to reduce the cytotoxicity , target ligands such as transferrin, folate, antibodies and basic fibroblast growth factor were tethered to promote complex cellular uptake [259-262], and histidine derivatives were grafted to improve the endosomal escape of the complexes . Nevertheless, the applications of PLL are widely limited in comparison with other polymers like PEI, CS and PAMAM [264-265]. Chemical vectors for gene delivery based on only one kind of pure materials, such as lipid or chitosan, have not only their special advantages but also their intrinsic deficiencies which are difficult to resolve. To improve the transfection efficiency and reduce the cytotoxicity, many researchers have focused on combining two or more kinds of materials to enhance the transfection efficiency and at the same time avoiding the side effects to the cells . Dendron-bearing lipids with PAMAM G1 designated as DL-G1-2C18 have been synthesized. In spite of less efficient cellular uptake of the lipoplexes, they generated free pDNA molecules in the cytosol more effectively than other lipoplexes did . Most importantly, the core-shell nanoparticles for gene delivery have been the hot topic in the past few years. Although calcium-phosphate precipitation has been used to deliver pDNA for decades, the method is typically characterized by low transfection efficiency relative to the other non-viral approaches, such as liposomes and polymers. Zhou et al. have developed a novel gene transfer vector comprising lipid-coated nano-calcium-phosphate (LNCP) that provides consistently efficient and satisfactory pDNA delivery . It is based on core-shell nanoparticles comprising of a calcium-phosphate core and a cationic lipid shell. This method, in contrast to the solution precipitation methods used in the past, yields colloidally stable calcium-phosphate nanoparticles inside the cationic liposomes. The LNCP has shown great potential as a novel transfection agent for gene therapy. Jiang et al. have designed another cationic core-shell lipo-nanoparticle (DLCS-NP) by enveloping the plasmid-laden chitosan nanoparticle (CSNP) into a cationic lipid shell to achieve enhanced gene transfection efficiency for ocular eye-drop therapy . The cellular uptake of DLCS-NP is up to 1.25-fold and 5-fold higher than that of CS-NP and lipid-coated chitosan nanoparticles (LCS-NP), respectively. Moreover, it is another promising direction for gene delivery to combine with advanced theranostic systems and a number of liposomes and polymeric carriers combined with approved therapeutics have entered clinical use or are under different stages of clinical application [270-274]. All the gene transfer methods (viral, physical or chemical) must overcome two major constraints: first, there is a need to carry the nucleic acids to the target cells without potential risks. Viruses are 'naturally' equipments with ability to recognize and locate defined target cells and are 'stealthy' with respect to the body defense mechanisms, such as the reticulo-endothelial system (RES). While chemical vectors should combine with other technologies or conjugate with targeting molecules to realize the specific location. The second constraint is the penetration of the nucleic acids into the cell through the plasma membrane. While viruses achieve this purpose using natural mechanisms, chemical vectors must perturb the plasma membrane (e.g. physical vectors) and/or internal vesicular membranes (e.g. the cationic lipids). In order to obtain an efficient vector system and achieve a high rate of cell transfection, these two conditions must be integrated in the development of an ideal genetic vector. Consequently, deep investigation of the transfection process incluing the endocytose of nanocarriers and the release of DNA from the complexes is the prerequisite for gene delivery research in the future. Only with deep understanding of the mechanism can we suit our methods to the situation. To pay more attention to materials with excellent biodegradability and biocompability is an important alternative to get effective gene delivery nanocarriers in the near future. Further, functional moieties such as cell penetration peptides to the nanocarriers could be popular to improve the transfection efficiency and at the same time decrease the cytotoxicity. What's more, different gene delivery systems should be effectively combined to make best use of the advantages and bypass the disadvantages, which tend to be the main stream in gene delivery. Inorganic nanoparticles possess many advantages in gene transfection, e.g. they are not subject to microbial attack and exhibit good storage stability . As a result of their small size, nanoparticles can penetrate the cell membrane and deliver drugs or biomolecules into living systems with moderate toxicity [276-277] or without any toxic effects on cells , depending on the concentration of nanoparticles used. There is a wide variety of nanoparticles and many of them have been tested in vitro and in some cases even in clinical trials, e.g. carbon nanotubes, chitosan nanoparticles, calcium phosphate nanoparticles and lipid nanoparticles [279-282]. In conclusion, it is not only a way full of challenges and difficulties, but also a way filled with hope and prospect in medical fields. This research was financially supported by the National Key Program for Developing Basic Research of China (2010CB933903 and 2014CB744501), the NSFC (61271056 and 31201003), Hunan Science and Technology Projects (2012SK3105), Scientific Research Fund of Hunan Provincial Education Department (11A030), China Postdoctoral Science Foundation (20100471362, 2012M520980 and 2012M511660), Jiangsu Postdoctoral Science Foundation (1301093C), Open Research Fund by State Key Laboratory of Bioelectronics, Southeast University, China (2013G10) and Economical Forest Cultivation and Utilization of 2011 Collaborative Innovation Center in Hunan Province.